Awhile back I posted about the fun of creating a new town for a series of books. In conjunction with the new town I also hatched ideas for three new stories to take place in my new town. Minutes ago my editor called with an offer for all three. Yay!! My new town is Prosperity, Montana, and the three books will feature three siblings–two brothers and a sister, each the star of their own book. I am excited to write these stories and will keep you posted with publication dates and more. Thanks for letting me share my news. Seven weeks ago, I hurt my finger in a terrible and easily-avoidable accident. (Warning: High yuck factor ahead.) I was using an immersion blender and needed to remove some peanut butter that had gummed up the blade. I should have unplugged the thing, but no. It was off, of course, and I decided to clean it with my finger. Darned if the dumb thing didn’t turn on. Ouch! One trip to the ER and seven stitches later, I returned home. It’s been a slow recuperation, aided by weekly visits to a hand specialist and twice daily soakings in Epsom salts, and fresh gauze and tape. Three weeks later, I graduated to two Bandaids. 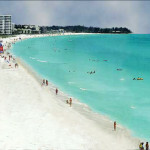 When I told the doc about our upcoming trip to Siesta Key, Florida, he heartily endorsed soaks in the ocean instead of Epsom salts. How could I refuse? The ocean water helped amazingly. I’m getting better every day, and this morning I met with a physical therapist to learn exercises that will help my finger gain flexibility and eventually desensitize the pad of my finger, which is ultra tender. All well and good, but the most interesting part of the physical therapy session happened out the window on the ground floor (I was on the second floor) at the apartment complex across the parking lot. There, drama unfolded! A young woman wearing pajama bottoms and a coat marched outside and headed straight for a car. I couldn’t see who was inside, but it was locked and the windows shut. The woman pulled on the handle and pounded her palms on the window. She seemed to be yelling, and when whoever was in there started to back out, she held fast to the handle. Scary! To my relief, the car stopped and pulled back into its slot. A minute later, the same thing happened again, like an instant replay. By then the physical therapist and the receptionist were watching along with me, all of us waiting to see what happened next. Maybe it’s the writer in me, but I wondered who the woman was yelling at, and why. The physical therapist and receptionist weren’t nearly as curious. We got back to my finger for a few minutes. The next time I looked out, the car was empty and the woman was chasing a little boy, who looked to be about three, up the parking lot. Was that why she clung to the door handle so tenaciously-because the little guy was in the car? If so, who had put him there, and where was s/he now? My creative juices kicked up their heels at the possibilities. I’ll never know what really happened, but that’s okay–I’ll make up my own story. Who knows, someday what I saw could become part of a future book. For now, though, it’s time to get back to work on my current work in process. 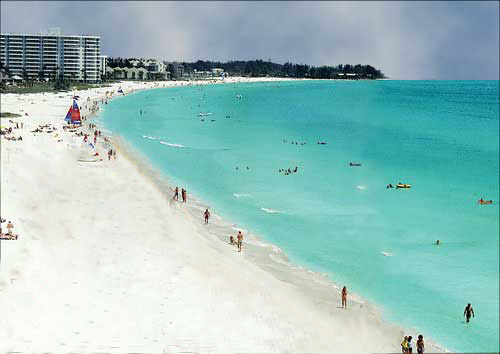 For the past two weeks, I’ve been here at Siesta Key. This gorgeous beach was voted the #1 most beautiful beach in America, and with good reason. I love so much about this place–the sun, being able to walk outside at night without grabbing for a sweater, the awesome wildlife, the food… and the beach and ocean.The sand here is made of crushed crystal and is the consistency of talcum powder. I’ve seen amazing birds, dolphins and all kinds of cool fish. Once a huge school of sardines filled the water. They formed perfect circles around we humans and swam on. Another time I saw a strange creature floating by. A biologist who happened to be in the water at the time said it was a mama squid with her egg sack. She was looking for a place to deposit her eggs. During our two weeks here, I worked some and played a lot! The weather gods have been wonderfully cooperative. In the whole two weeks, only two days were muggy. The rest of the time, the weather has been perfect! My hubby and I like to wallow–swim out a bit and then do a little dog paddling while we bob up and down in the waves and enjoy whatever we find to watch–people included. Such a pleasant way to spend thirty minutes. Yesterday i came to an impasse in the story I’m writing. Could not figure out what to do, but a lengthy wallow fixed that. I was watching a couple pelicans fly overhead in search for an afternoon snack, and suddenly I thought of a way to fix the story. I love when that happens. They say that the sign of a good vacation is being ready to go home. I am! I’m ready to write and write and write. Peel, core and chop apples into small pieces. (I don’t bother peeling the apple) Peel and chop the onion. Heat butter in skillet and add apple and onion. Cook until the onion begins to brown, then add curry and coriander. Cook 2 minutes, then remove from heat and allow to cool slightly. Put onion mixture into a bowl and add all the other ingredients. Moosh thoroughly with your hands for about 4 minutes. 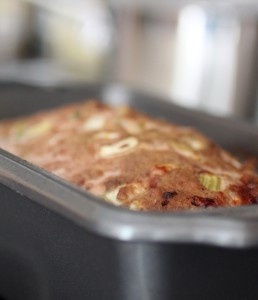 Pack into a 9 x 5-inch loaf pan. 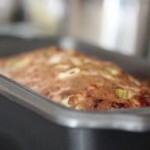 Bake for one hour or microwave until fully cooked. Let the loaf sit for 3 minutes. Pour off any juices, then slice loaf. Servr with chutney or ketchup or just enjoy it plain.